Matano Lake Forest Complex, Mahalona and Towuti which used to be a government administrative area of South Sulawesi Province Luwu originally designated as forest area based on the Decree of the Minister of Agriculture. 45 / Kpts/Um/1/1978 January 25, 1978 with protection function. In 1978 a survey conducted by the Director General of Forestry to assess its potential. On April 17, 1979, the Director General of Forestry suggested this region to be designated as an area of Nature Park to the Minister of Agriculture, through its letter No.. 1243/Dj/I/1979. Noting the letter of the Director General of Forestry, the Ministry of Agriculture and then designate the area of Lake Matano, Mahalona and Towuti become Nature Park conservation area with the name of the Natural Park of Lake Matano, Mahalona Lake Nature Park, and Lake Nature Park Towuti through Decree No. 274/Kpts/Um/4/1979 April 24, 1979. In general the conservation area Mahalona Lake Nature Park consists of lake waters. Lake water source comes from several springs and cacthment area around the lake that enter the lake through 3 rivers and creeks, one of them is the flow of river water from Lake Matano addition, there is the river that contact with TWA TWA Mahalona Lake Lake Towuti. .
Tectonic lake with lake depth reached 73 m. The maximum lake area of ± 2337.5 ha (2440 ha in the Indonesian Ecology Series, Volume 6: The Ecology of Sulawesi (Whitten et al, 2002)) at an elevation of ± 300 m above sea level. Lake water source comes from several springs and the surrounding catchment area into the lake through 3 rivers / creeks. One of them is the river flow that comes from Lake Matano. Crocodile Crocodylus porosus and Soa-soa Hydrosaurus amboinensis and 8 species of freshwater fish endemic to the residents of Lake Mahalona that can easily be found. Enhydris matannensis is a freshwater snake species that live in this lake. Species of bird that can easily be found, among others, of Little Snake Anhinga melanogaster who dived into the lake to fish and then drying their feathers in treetops. On the river with thick trees on the side of the river, was described Babyrousa babirussa and endemic birds of the family Bucerotidae Sulawesi. In this lake area and four lakes in the vicinity (Matano, Towuti, Wawontoa and Taparan Masapi) never consumed fish species introduced carp Cyprinus carpio and Sepat Trichogaster trichopterus originating from Central Asia in the early 20th century (Whitten et al, 2002). Mahalona Lake Nature Park can be reached by road from Makassar. The distance of Makassar to the region Mahalona Lake Nature Park as a whole is ± 580 km, with a path Makassar - Pare Pare - Palopo - Masamba - sorowako - TWA. 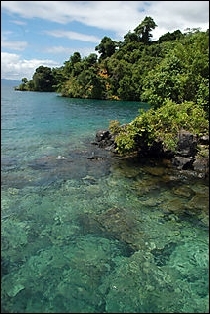 Lake Mahalona Or Makassar - Pare Pare - Palopo - Masamba - wowondula - timampu - TWA. D. Mahalona. Transportation by air can be also be conducted from the airport to the airport in hasanuddin sultan's sorowako pt. inco with travel time about 1 hour. Conditions through which the road is relatively good (provincial roads, district roads and roads PT. INCO). Travel time ranges from 11 to 12 hours. Also Mahalona Lake Nature Park can be reached by using the Aircraft to the city Masamba (Capital of North Luwu) and then continued with ground vehicles to the village Timampu, further from the village of Timampu use a motor boat measuring 24 Pk through Lake Towuti with travel time ± 1 hr.